Valmet will supply a Valmet IQ Web Monitoring System (WMS) and a Valmet IQ Web Inspection System (WIS) to Blue Paper SAS's Paper Machine 1 in Strasbourg, France. The systems will improve the machine's overall production efficiency. "As we have established a long-standing partnership with Valmet for many automation systems, we naturally wanted to look at their solution in the field of web break analysis and web inspection. The discussions we had with Valmet throughout the supplier selection process, as well as the tests we carried out on site with the WMS hardware, convinced us that the Valmet IQ process and quality vision system is a powerful integrated solution that will meet our expectations," says Vincent Muller, Electrical and Automation Manager, Blue Paper. "Valmet is capable of offering complete automation packages, including process controls and quality controls. Valmet IQ Web Monitoring and Valmet IQ Web Inspection Systems play a vital role in developing quality and total machine efficiency. We are excited to be able to provide the applications and services needed to meet our customer's goals and continue an effective partnership by strengthening our local presence," says Patrick Rojo, Sales Manager, Automation, Valmet. Valmet's delivery consists of a Valmet IQ Web Monitoring System (WMS) with 21 cameras throughout the whole production process on Paper Machine 1 and a Valmet IQ Web Inspection System that combines transmission and reflection detection. The high-speed cameras will monitor critical process areas and help operators analyze the root causes of runnability disturbances. Blue Paper's Strasbourg mill produces corrugated base paper made solely of 100% recovered paper in an environmentally friendly process. 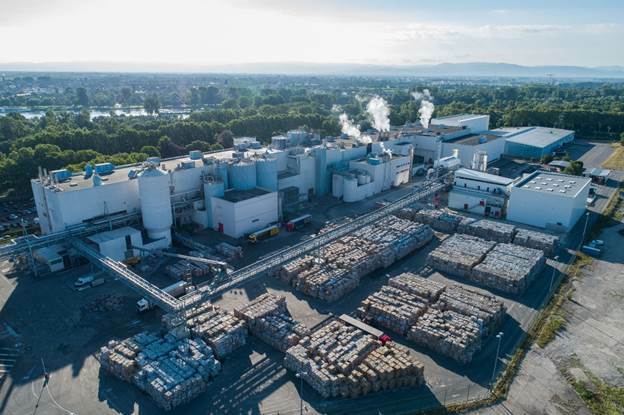 Blue Paper SAS was established in 2013 when UPM Kymmene Group, the previous owner of the Strasbourg LWC mill, sold the mill to German Klingele Group and Belgian VPK Packaging Group, which converted it into one of the biggest plants for the production of corrugated base paper in Europe. The 160 Blue Paper employees produce up to 400,000 tons of corrugated base paper per year. Valmet will supply a Valmet IQ Web Monitoring System (WMS) and a Valmet IQ Web Inspection System (WIS) to Blue Paper SAS's Paper Machine 1 in Strasbourg, France.